The Raspberry Pi is a single-board computer which was designed with DIY and hacking in mind. It's cheap, has a bevy of open ports, and has been adapted to serve many uses (including as a weather station, a laptop, a computer with a Kindle screen). The Raspberry Pi is designed to work with any number of sensors and DIY components, including the RePaper development boards, and a new special-built component just launched on Kickstarter. Percheron Electronics is soliciting donations to cover the costs of manufacturing a daughter board for the Raspberry Pi. The e-Paper HAT, or Hardware Attached on Top, is designed to plug in to the Raspberry Pi and add a 2.7" E-ink screen. The E-ink screen was developed by Pervasive Displays, and it boasts a screen resolution of 264 x 176. It's mounted on a board developed by Percheron Electronics. That board also contains a real-time clock that runs on a separate cell battery for back up. 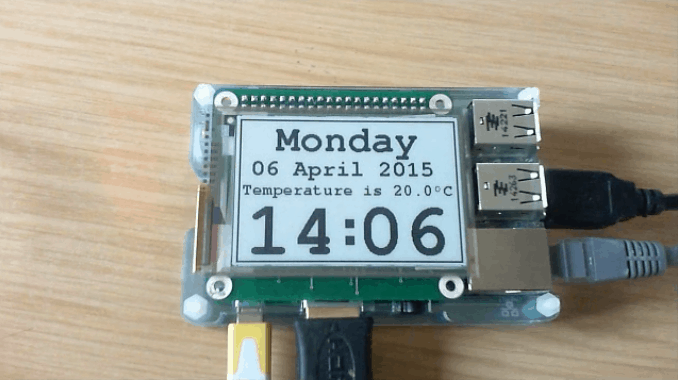 This isn't the first E-ink screen to be paired with a Raspberry Pi, but its developer wanted to offer a more compact alternative which could be neatly slotted into place without trailing wires. He foresees that it can be used to create a desk clock, readout for a weather station, to display a Twitter feed (someone beat him to that idea), or anything you can come up with. Linux Gizmos notes that the e-Paper Hat runs the same code as Pervasive Display's RePaper development boards, which means that you might be able to adapt a project developed for one of those boards and use said project with your Raspberry Pi. If you want to get an e-Paper Hat, the minimum backing price is now £39, and you can contribute more and get multiple screen units. The campaign runs until 10 May, and it is almost fully funded at the time I wrote this post. The current projected delivery is August 2015. P.S. If you miss out on this campaign and still want to add an E-ink screen to your Raspberry Pi, you should check out the one offered by Embedded Artists. There's also a tutorial posted on ADAFruit which shows you how to use a RePaper development board to add an E-in screen to a BeagleBone Black or a Raspberry Pi.